15 Brides who stunned us with their minimal jewelry choices for their wedding day! Being an Indian bride and tying the knot in a big fat desi wedding means you gotta take the extra glam route. Meaning - wearing a lehenga equal to half your bodyweight and jewelry that brightents that whole room. Well not really, haven't you heard ‘minimal’ is the new chic? This bride wore statement jhumkas paired with 2 minimal necklaces and a delicate matha-patti. If you are a bride who’s planning to swap her lehenga for a saree and go minimal with your jewellery, Archana Walavalkar, the CEO of Stylecracker shows you how! Can’t take my eyes off this bride, her entire look shouts out minimalism and elegance. Trisha Khatri chose to wear a simple choker and earring set with just a kada on each of her hands to take her pheras and stole our hearts with her minimal jewellery choice. Completely in awe of this bride who looked her radiant self in a barely-there jewelry set. She balanced her shimmer Sabyasachi lehenga with a very simple diamond necklace, earrings and maang tikka set. Kudos to this bride who wore a delicate-but-unique matha-patti paired with a necklace and earring set and looked her stunning self. If you too are planning on going nath-less, then here’s how too! Totally stunned by this bride who wore a chand tikka and statement earrings, to balance the absence of the nath. Another stunner to the list. Love how this bride has worn a single string kundan matha patti to balance her statement choker. Brides are known to go over-boars for their sangeet. Totally digging this bride who wore a minimal ruby encrusted choker on her sangeet and slayed it. Another stunner to the list of bride’s who didn’t wear a nath for taking their pheras, I totally love her minimal pick for her bridal jewellry. She choose to wear a statement choker with heavy earring and balanced the look with a minimal matha patti and day makeup look. Isn't she just beautiful? I am loving this bride who wore just earrings and maang-tikka for her mehendi ceremony. If you are planning to go minimal on your bridal jewellery, this sure is a look to consider. If you are not a fan of the necklace, I say totally take notes from this gorgeous lady. This bride gets brownie points for opting those statement earring and maang tikka set and ditching the necklace. If you wanna go minimal and still look very desi-festive, then you have to consider this bride’s mehndi look. She has ditched all her jewelry and wore just statement danglers paired with floral armlets and grabbed all the attention. In love with this bride who wore just a statement necklace and balanced it with minimal earring and maang tikka for taking her pheras. This radiant beauty wore just 2 strings of diamond necklace paired with equally minimal earrings for taking her wedding vows. *Stunner Alert*. 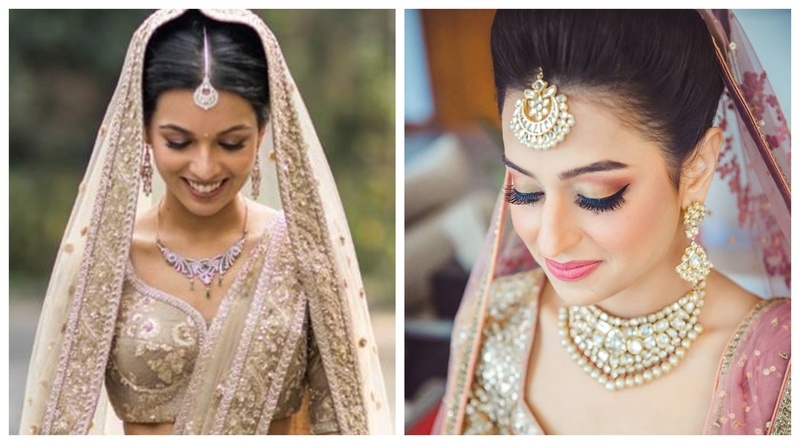 If you too are a minimal bride-to-be then, then I suggest take inspiration from these looks and slay your wedding day!